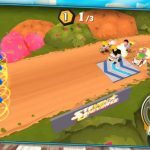 Cartoon Network’s Formula Cartoon All-Stars is a racing game for iOS and Android devices that features some of the cartoon channel’s most beloved characters, including, but not limited to Finn and Jake of Adventure Time, Ben 10, Steven Universe, and many others. It’s a kart racing game where you have to master the use of all sorts of crazy power-ups, which include bubbles, ice cubes, tomatoes, etc. You can mix more than 100 different pieces, as you personalize and customize your kart, coming up with a unique vehicle that you can truly be comfortable with. 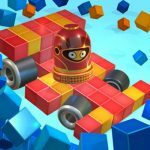 Before you start playing the game, we would suggest giving our Formula Cartoon All-Stars cheats and strategy guide a quick look-see – this is the first in a two-part series, so check this out and be sure to return for the second part! You can’t expect to win a lot of races, especially when the competition gets tough, if your kart doesn’t get a steady stream of upgrades. Fail to upgrade your kart when you should and you’ll invariably find yourself behind the pack – a “back-marker,” to borrow a racing term. However, you shouldn’t just upgrade any attribute at random – it’s also essential to upgrade smartly. For example, the Top Speed upgrade can help your kart catch up when behind or preserve its lead when ahead. We suggest going with speed upgrades first ,followed by Acceleration, then Turbo in terms of priority. As we said earlier, Formula Cartoon All-Stars has power-ups which you can use in a race to give yourself an advantage. You can collect power-ups by driving over a floating gift, and use them when you feel it’s necessary. It’s a good idea to read up on each power-up and be aware of what they do and when you should use them. You can’t win ‘em all – there may be situations where you believe that your chances of winning are slim to none. You can always replay that race and go get ‘em the second (or third…or fourth…you get the idea) time around. 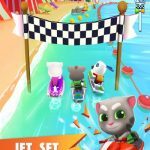 But if you’re behind with no chance of taking the lead, don’t quit the game just yet – you should use the rest of the race to focus on collecting items, such as gems. Those gems and other goodies can help you anyway when replaying the race, so don’t let your imminent loss be a total waste. One thing you should do in this game is always make sure that you’ve upgraded to whatever the current limit is. Gems can be used for full level upgrades, and upgrades won’t have any noteworthy effect at all unless all three bars are completely filled up. 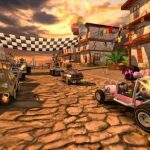 Customization is one of the main selling points of Formula Cartoon All-Stars – there is no limit on what you can do to your kart. For example, you can have a character from one cartoon driving a car that belongs to someone from another cartoon, and it won’t make a difference on the racetrack.